It's been said before that Casabalanca isn't just a film - it IS film. Such are it's achievements in the medium, it's timelessness, it's epic scale and it's heart that beats lovingly for each successive generation who become enchanted with it's winsome charm, Michael Curtiz's movie has become the bench mark by which cinematic achievements can be measured; the one word title of the film has come to provide the perfect, evocative answer to the question: "What is film?" This being the case, Mother India, the 1957 Bollywood movie isn't just an Indian film, it IS Indian film. 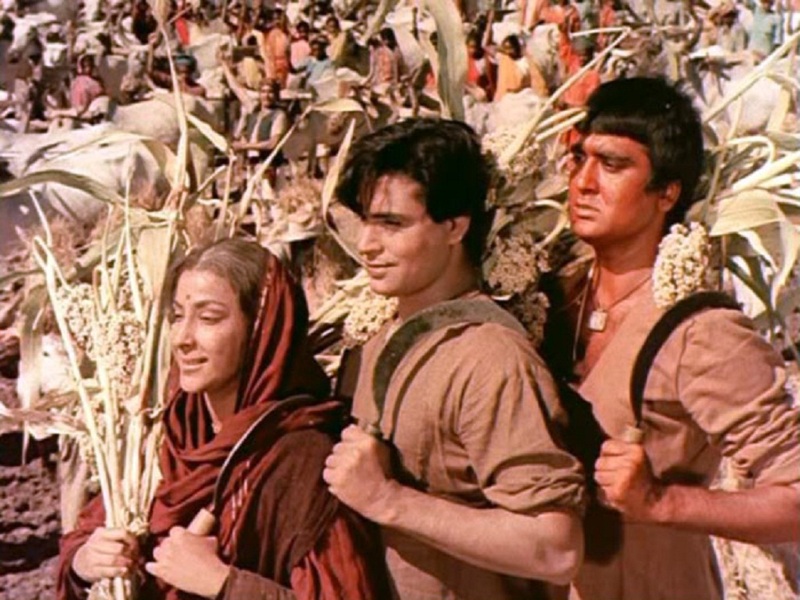 The story focuses on Radha (as played by Bollywood icon Nargis), a strong woman who stoically leads her family through tragedy after tragedy; the pain and suffering she goes through is not dissimilar to Maria Falconetti in The Passion of Joan of Arc but, in this instance, what provides her stoic endurance is not so much a belief in a deity looking down upon her but in the courage of her convictions and love for her family. Indeed, as Sukhilala, (an antagonist of such evil bent and shallow greed he would shame It's A Wonderful Life's Mr Potter), begins to turn up the pressure on the impoverished Radha and her starving children to repay debts he has manipulated them into, it's not impossible to wonder if the Gods and Goddesses have placed a curse on the mother to live a life of abject suffering. Things get even worse when the heavens open to destroy the lands the village's crops are grown on. Yet, despite all this, Radha summons a resilience of unparalleled virtue as she vows to protect her family whilst staying true to her beliefs - as her children begin to suffer, it becomes less clear whether the manipulative Sukhilala can make her abandon her graces in order to protect the ones she loves. In short, Mother India is an astounding film to have experienced; shot in glorious Technicolour and managing to flit between Vittorio DeSica-esque episodic narrative through to the more familiar (and now established in Bollywood) majestic songs, the feature is a joy to behold. It is guttural and visceral at points, pitching itself perfectly as an Asian Gone With The Wind-style epic emotive spectacle; yet equally, away from the grand scale climax and huge set-pieces, there are some smaller, more intimate tales and tear-jerking portrayals of families under pressure (at points reminiscent of Luchino Visconti's Rocco and his Brothers). It is the combination of the two approaches which makes the film so powerful and so influential; its huge scale has set the scene for the sensational aesthetic approaches many Bollywood films now take as standard and the powerful tale of a strong mother negotiating family and honour, at once uniquely Indian yet equally global in theme, is a tale which will stay with a viewer long after the curtain has closed on a wonderfully emotive crescendo of a climax. As a final note: This was screened at Bradford Film Festival from a scratched grainy print, something which really added to the occasion. The movie washed over the audience with the same type of joy that can be found from listening to a vinyl record; the imperfections add to the overall feel and sincerity of performance. A truly marvelous experience.